Forms convert great...but what about the code? Event Handlers: We have painstakingly compiled a huge list of every VB6 control's event handlers as well as a list of every VB.Net control's event handler to allows near perfect conversion of VB6 event handlers. Dim / Static Statements: Variable scope is different in VB.net than it was in VB6. Our converter moves all Dim and Static statements to the very top of the sub or function to ensure the variable is visible throughout the entire function. It also makes your code cleaner too! Custom Functions and Parenthesis: Our converter scans for custom functions and determines their scope in relation to each file being processed and places the correct number of parenthesis around calls based on number of arguments. sRetVal = Test1 vPing("Hello", "World"), "Testing"
In other words, VB6 code did not always need to specify parenthesis "()" around all function calls. Msgbox "Hello", ,"Hi!" , for example was fine. Our converter scans for subs and functions and the number of arguments they require and modifies the code to use Parens such as Msgbox("Hello", ,"Hi!") It even scans for your custom functions and fixes parenthesis when the method is called. Even if your function is called as an argument to a different function, it will fix the code accordingly. Control Arrays: We developed our converter to give your code a unique advantage by creating special functions that mimic a control array which allows it to work in about the same way in VB.Net even though they no longer exist! See the videos to watch it in action! References: All VB6 references can be converted. You simply need to have the files that the project is referencing. FRX processing: The Avotova VB6 Converter extract all images in each FRX file and reconnect those images to toolbars, list boxes, forms, etc. Unused images in each VB6 ImageList control are also extracted into the converted project's "Resources" folder. Database Usage: VB.Net uses IMPORT statements to connect to SQL Server or Oracle. These are easily added to migrate your older VB6 code to newer code models. Our converter, however, currently converts your code as it is. Our in-house migration experts can help you change it if needed (through our consulting service) or your developers can do a "find and replace" to convert it. App Object: VB6 had an App object which is no longer supported in VB.net YET our converter includes a reference called "App" in every form, module, or class it converts which mimics the app object to make your VB6 code run as you'd expect! Constants: VB6 objects such as ADO, RDO, etc had constants with very unique names that were often used in VB6 code. Our converter has a huge list of constants that get replaced with their numerical equivalent which allows the code to run as you'd expect. Program Information: Company name, description, version numbers, copyrights, trademarks, etc are all converted. Your startup form is maintained as well. Embedded Images: Many VB6 projects had images embedded in their FRX files. Our converter may be able to pull those images out of the FRX file and use them in your new VB.Net app! Watch our video that shows the images extracted! "Me" Keyword: VB.Net does not allow forms to reference themselves by their name. Our converter replaces the Forms' name with the Me keyword to make it run correctly in VB.Net. Methods: VB.Net uses different methods for controls. YET you should still expect that there will be items that may need to be "tweaked" or fixed by one of your VB.Net developers. All converted code should be retested by your business unit before deploying to production. Submit for Free 14 Day Trial! Your trial ID is normally generated and emailed to you within 1 min. 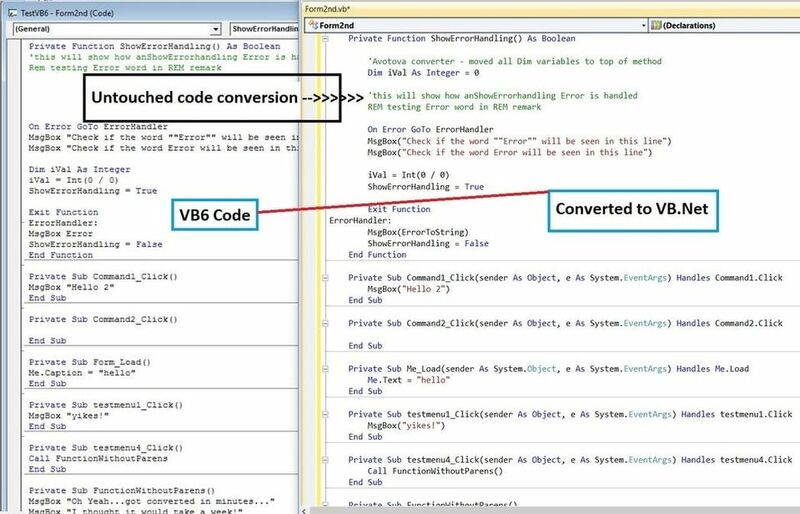 We make Visual Basic 6 to Visual Basic .Net ​conversions easy. Test the Wizard for yourself. Signup for a free 14 day trial. There is no obligation and no credit card is required to try it. You have nothing to lose! Do you know someone who might need this? Sign up and we'll send you information soon on how to make a commission for getting us in touch with people who can use this! Please review actual conversions on our VIDEOS page!